The easiest way for you to gain back control of your closet space is to take stock of its contents. Take everything out, and yes, we really mean take everything out. Assess each item before placing it back in the closet. If you have a doubt about any particular item, toss it or donate it. Use our handy list as a guide. Be merciless in your judgments! Clothes that are tattered or torn beyond repair. Shoes that your cobbler would laugh at. Your over supply of painting and gardening clothes. Clothing you “can’t part with” but never wear. Clothing you have been “dieting” to get into — for years. Items “on the verge” of coming back into style — for years. Don't simply toss everything back in! You've made the effort to pull it all out, now it's time for the organizing portion of your plan. Choose what possessions are important and truly meaningful (or in the case of clothing, items you will actually wear) ... and purge the rest. These next few ideas will help make your closet look neater and make items easier to find. Eliminate wasted space! Dress for the body you have now rather than having various sized clothes in your closets that are not being functional. This eliminates stressing over clothes that don’t fit any more. And it allows room for everything that does fit to be visible and easy for you to access. Keep only ONE pair of "skinny" pants for weight loss inspiration. Any more than that is just cluttering your closet. Consider investing in all new hangers. You'll be amazed how much neater the exact same closet can look when all the hangers are the same style, shape, and color. 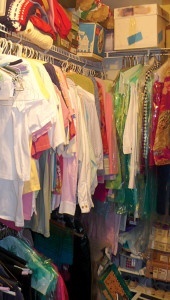 Try grouping clothes by item and color. The initial time it takes to sort your shirts, jackets, blouses, dresses, etc. is well worth the effort. Instead of looking all over for something, you can go directly to a grouping of blue, green, black, red items and find just what you need. Fold, never hang, your sweaters and knits. Also, do your best to avoid squashing shelf items. Clothes that have room to breathe will last longer. Place everyday shoes on lower shelves. Store your special occasion shoes in labeled boxes on higher shelves. Store purses flat and stuffed with tissue to retain their shape. If you haven’t used a purse in 2 years or doubt you will ever use it again, give it away! 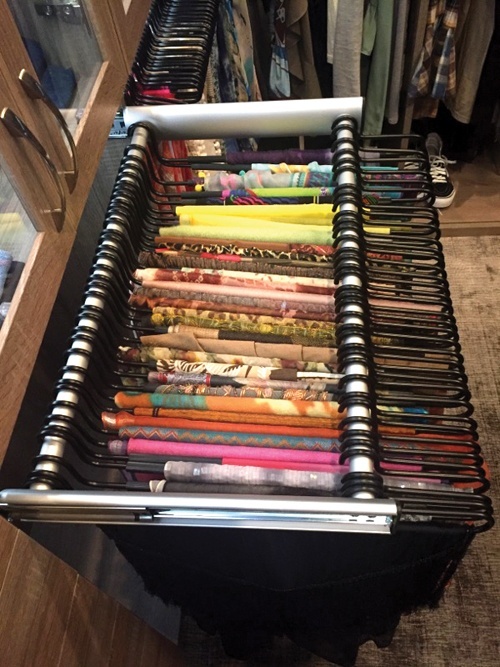 Store scarves neatly folded on an eye-level shelf for easy selection. (Or hang scarves on the pegs of a retractable rack that we offer). Rotate “stock”. As you add new items to your closet, discard other under used clothes. Smaller stacks of folded items look neater and won't topple over like larger stacks will. It’s easier to organize and keep control over your closet when the space is specifically designed to store your things. At Closets & Cabinetry by Closet City, our design consultants understand how to organize and plan a space to fit your personal needs. 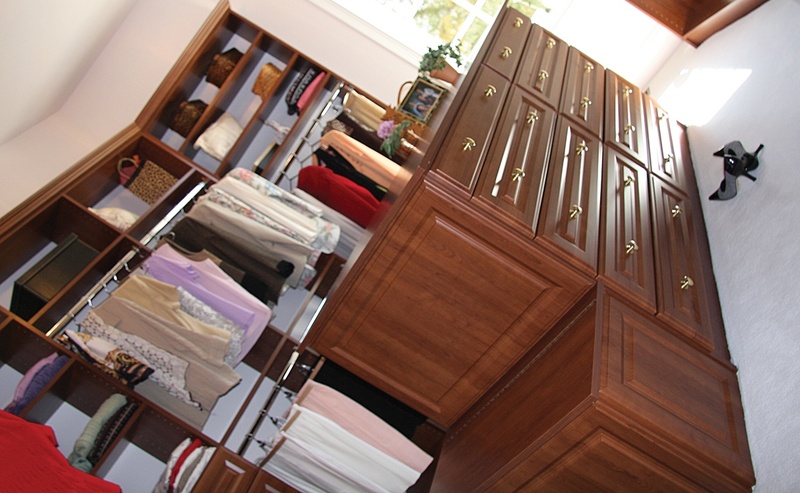 Request an appointment and get that troublesome closet organized today!